I have taken to meditating. I need it to remain calm. My life is hectic. I pull down the shades in my cluttered bedroom, light some incense, turn on some soothing natural sounds and close my eyes. I try very hard to sit still and not think. Or if I have a thought, I let it float into and out of my head without judgment. 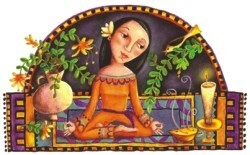 I am not quite sure what is supposed to happen when I meditate, but my expectations are small. I merely want to gain absolute insight into the inner workings of the universe and the true nature of man (and woman) i.e. myself. So far, I have figured out that I have trouble sitting still and that my chin starts itching if I try too hard and I try to resist it but then the itching compounds and then I have to scratch it and then I do and then I open my eyes and inhale too much primrose incense and then start coughing well you get the idea. Meditation over! This has happened several times. Until two days ago. It was a Thursday. It was very cold and icy outside. I was pleased that I had nothing to do that day. No rehearsals, no school obligations for my son. We had leftovers so I didn't have to cook. I could hide in the cocoon of my house and just meditate and contemplate the aforementioned universe, its workings and of course human nature. My bedroom was warm. I turned off the phones, lit the incense, I decided on night blooming jasmine and this time turned on the music and so on. I sat down and prepared to face myself. I time the meditation based on the CD I am listening to. I set it for a twenty minute track of water fall noises and birds chirping. I closed my eyes and the usual itching assailed me but I resisted. For what seemed like an eternity, I tried hard to keep my mind an empty vessel but thoughts kept rising. Thoughts I have not had in a long time, about people, whom I am having an impossible time forgiving. Well actually a person who betrayed me and whom I never properly told off. Who, I try hard not to despise but cannot seem to view with compassion or understanding. I am fully aware this is a powerful failing on my part. I am somehow anchored to my loathing of this person, which is why I am writing about him. I have not yet attained that wisdom that allows a human being to forgive another fully. And I have forgiven different things on different occasions. When you are married, learning how to forgive is an essential ingredient to avoiding divorce. This person is not someone I was terribly close to. He is younger than me and just as ambitious. His family obligations drive him to earn as much money as he can and to swagger around like an inflated used car salesman, showing off and boasting about who he knows and how important he is. I trusted him with something that meant a great deal to me and to a certain degree, defined me, my work, well specifically one work, a screenplay that I had laboured over for years and that had won praise. I will not get into the details because this is not about what he did, this is about the fact that I must learn to forgive him for what he attempted to do and that this is an imperative life lesson for me. I can pat myself on the back for all the good deeds I have done, for having integrity, but I am acutely aware that if I cannot forgive this person then I am far away from attaining real humanity. Let it go, is a phrase I have heard many times in regards to this situation but usually from people who have never created anything, not even life. Someone suggested I tell him off, something I am notoriously good at, but I have not had the opportunity. As I sat and thought deeply about him, tears started pouring down my face. I started feeling very sorry for myself, an indulgence that has never done me any good. No one had defended me against him, I thought petulantly. No one had told him he was a dishonourable heel. Not my husband, not my parents, not my sister, who knows him, not anyone. A feeling of complete aloneness came to me and I felt cold. But I did not open my eyes, and then I let out a deep breath. I forced myself to start thinking about his good qualities. Yes, everyone has good qualities, I thought. Even my President is funny sometimes usually not on purpose but he has strong entertainment value. I started recounting in my head what this fellow's positive traits were and a miracle occurred. Maybe it seems I am exaggerating but I know there are quite a few among you reading this who have people in your lives, work colleagues, family members, can anyone say mother-in-law? With whom you would not want to be stranded on a desert island. So please don't pretend we cannot learn a lesson in forgiveness. Now back to the miracle. It was this: I suddenly felt badly for him and not myself. He was under so much pressure from his family, namely mother, to make money, to be the big man in the room. He was constantly being compared to others who made more money. He must (I believed at that moment) have felt a tremendous urgency to make his mark in some way. People are not all bad or all good, life would be markedly less interesting if they were and I do believe that some people have more good in them than bad and vice versa. He was, in my opinion, a person who was weak and succumbed to the pressure of being a big shot. It could not have been easy for him, I thought as I inhaled the night blooming jasmine. And just like that my loathing started ebbing away. This was the miracle. He almost cost me my work, and I hated him for the manipulation he had exacted on me in an effort to gain the upper hand for two years, but at that moment I could see clearly his pain, his inability to do the right thing because so many expectations were placed upon him. We all put so much pressure on ourselves to attain some nebulous idea of success that is those of us who have the luxury to do so. There are quite a few people, some of whom are standing next to you right now possibly who are just thinking about when next they will eat. And somehow our humanity, the true essence of who we are runs away from us or we walk away from it. Whatever the reason, though I had a massive breakthrough moment in regards to this situation, I still have a long way to go because as soon as I inhaled the incense a second time, I started coughing and the image of my punching him in the face popped into my head and God forgive me, I smiled. Well Rome was not built in a day.